John Travers and Ann Marie McGlynn wrote themselves into folklore as they landed the 2018 AXA Raheny 5. Travers battled home town favourite Mick Clohisey in a titanic struggle between the European indoor finalist and the Olympic marathon runner. 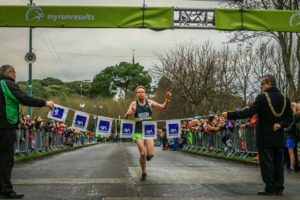 Travers got the better of Clohisey as the race moved through St. Anne’s park with Travers coming home in 23 minutes 38 seconds to become the second Donore Harriers man to win in Raheny behind three time winner Gerry Curtis. Clohisey came home some 12 seconds behind Travers with Clonmel man William Mansuell taking third place in 23:56. 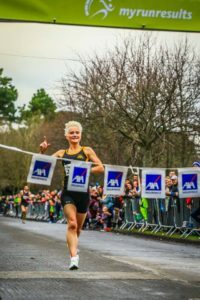 Ann Maire McGlynn landed her first AXA Raheny 5 title posting 26 minutes 44 seconds some 51 seconds clear of Leevale’s Michelle Finn with Metro St. Brigid’s Catherina Mullen third in 27:34. Fourth place Linda Byrne led Dundrum South Dublin to the women’s team title with a total of 17 points, Byrne was joined by Fiona Clinton (fifth) and Sarah MacMahon (eighth). Host club Raheny Shamrock took second place with their team of Fiona Stack, Karen Crossan and Zoe Quinn totalling 49 points. Crusaders were third with 59 points, followed by Sportsworld, Sli Cualann and Portmarnock in the top six. The Raheny Shamrock team of Mick Clohisey (second), Mark Kirwan (sixth) and Cillian O’Leary (12) were deserved winners of the men’s team prize with 20 points. Donore Harriers (35pts) took second place with Clonliffe Harriers (71pts) third followed by Rathfarnham, Crusaders and Brothers Pearse completing the top six. It was another amazing day as Raheny proved itself to be the home of Irish athletics, welcoming over 3,000 runners completed the famous and most loved road race in Ireland. 1,000 children took part in juvenile races before the main event to showcase Raheny and Raheny Shamrock as the biggest community club in the country. A large number of competitors also supported the Save St. Anne’s Park campaign. Thank you to everyone who made the 34th AXA Raheny 5 special and thank you to the people of Raheny for supporting the biggest and best road race in Ireland.